It is in a house and its dependence, tastefully decorated, that we can accommodate up to 8 people. Not to mention the sauna to help you relax. The large garden will allow you to enjoy the calm of the village and enjoy the view of the valley. In the house: On the 1st floor, there are 2 bedrooms, 1 bathroom with shower, 1 toilet. On the ground floor, you have the kitchen, 1 toilet and the living room with its panoramic view overlooking the terrace of 25 sqm. In the basement, you will find the sauna for 6 people with its large shower, as well as a laundry room with washing machine. In the outbuilding, there are 2 bedrooms, a relaxation area and 1 bathroom. To park the cars you have a private parking and a garage. Come spend a few days in a village located in the heart of Alsace, between Strasbourg and Colmar. Many tourist sites like the Castle of Haut-Koenigsbourg, the flying of the Eagles and the Monkey Mountain will delight young and old. Athletes will find such a few kilometers ski slopes, paragliding departure, hook-branches, an equestrian center and a nautical center. 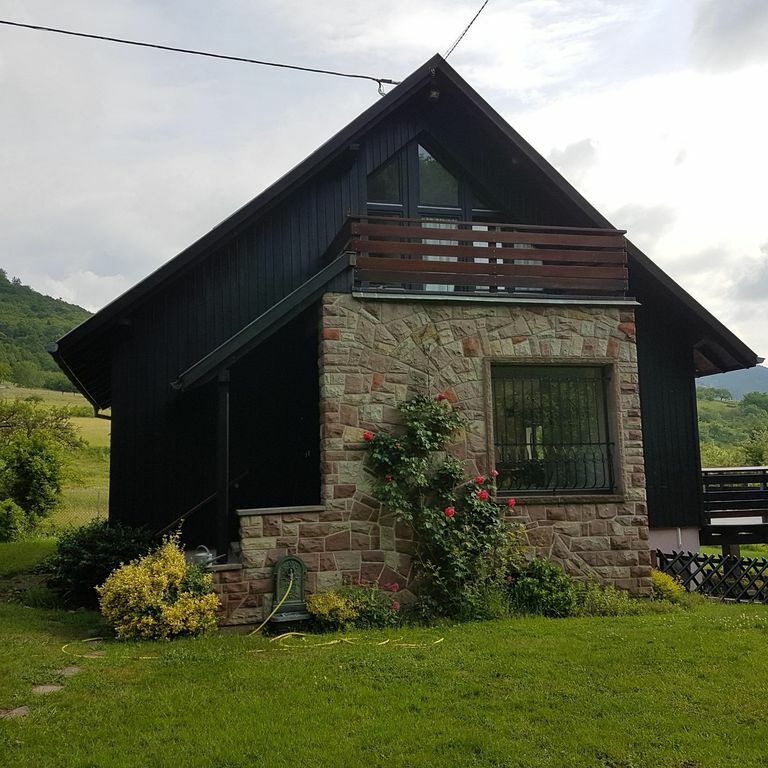 And finally, walkers, hikers and mountain bikers can take the start of the house to discover the landscapes and mountains of this beautiful region. Wir haben eine wunderschöne Spätherbst Wander- und Ausflugswoche im Elsass verbracht. Das Ferienhaus mit Dependance ist einfach nur superschön! Perfekt auch mit unserem Vierbeiner, dank Auslaufmöglichkeit rund ums Haus und im nahen Wald. Mitten in der Natur genossen wir die prächtigen Herbstfarben in Wald und Wiese. Ausflugsziele wie die Königsburg oder das Erlebnisstädtchen Riquewihr sind in kurzer Zeit erreichbar. Dieses Domizil ins sehr, sehr empfehlenswert, auch für Familien. Super accueil ! gîte splendide ! un petit coin de paradis dans une magnifique région !